The church is ancient but was restored in the last century. An entry in the church register indicates thay King Charles 1 stopped at Cyffylliog to review his troops during the English Civil war. Another interesting feature of the church is a set of dog tongs. 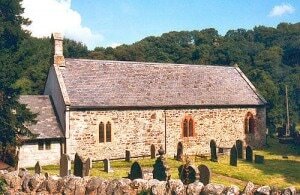 The church is s et in a quiet and peaceful location by the side of the river Clywedog four miles north-west of Ruthin.